I will now proceed to rant about the local weather like an old man in a rocking chair might (if he could find time between yelling “Get off my lawn” to the neighborhood children). If you’re pressed for time or could care a less about snowstorms in May, I excuse you from reading the following paragraph. I woke up yesterday morning with the song “Wake Up To the Sun” by Limblifter in my head. Why don’t you go give it a listen while you finish reading this captivating update? Allow me to set the stage for the story of relentless change you’re about to be graced with. It was 26° C just over a week ago (that’s roughly 79° F for you non-metric folks). The trees were budding, the flowers were blooming, the birds were singing and the grass was turning that beautiful shade of deep green that signals Spring has finally arrived. I even bought a new pair of shorts recently. So there I was, singing along to a song about awaking to the sun, happy as could be, when I looked out my window and noticed that there was almost a foot of snow on the ground and nothing in sight was actually green. The weather station’s forecast for light snow turned into a below zero blizzard overnight. On top of that, the wiper blade on the driver’s side of my car somehow snapped off in the middle of the night, so I had to stop every few blocks to wipe my windshield off on my way to work. This is fairly normal though, compared to the year that Fort McMurray was blessed with a blizzard on June 30th. Ya’know what’s sad? This is typical Albertan weather. But, as my father always told me, “at least we’re not gettin’ earthquakes and hurricanes”. I was at a friend’s place a few days ago and they decided to be nice and make me a homemade iced cappuccino. I thought it was a day for new beginnings, so I grabbed a straw and gave it my best shot. Lo and behold, I can once again drink through a straw! I’ve probably been able to do so for a while now, but I haven’t tried. This means I can go for milkshakes now! People keep asking me why I’m continually rejecting invitations to social gatherings. It’s not because I’m being rude and it’s not because I don’t like people. I’m choosing to avoid these parties because I’ll want to talk to everyone and I’ll want to meet people and be friendly, but I can’t because if I talk too much, my face will swell up and my jaw will start throbbing. You don’t quite understand just how frustrating it is to be in a room full of people and not be able to be yourself. Also, when you’re normally outgoing, and all of a sudden you’re the quiet one, people assume you’re not having a good time, and then you have to deal with the incessant question, “You’re not having fun, are you?” If you can find me a single person with a swollen face and a splint in their mouth who desires to be in a club with loud music, alcohol, food and more people than they know what to do with, I’ll admit defeat. 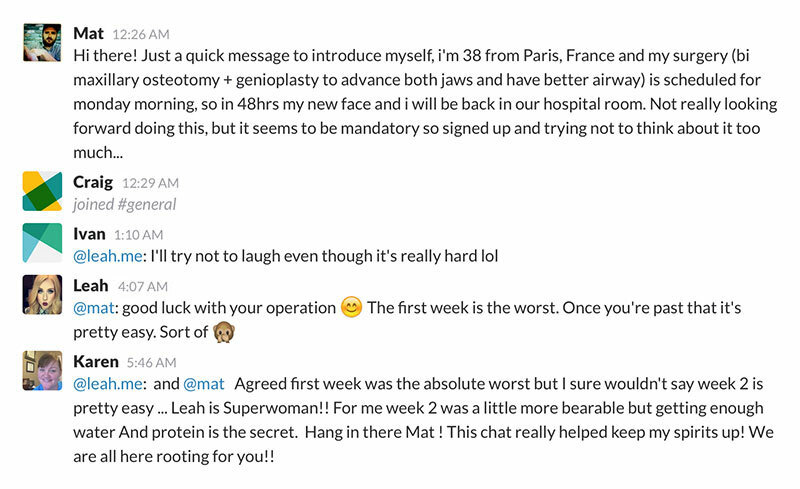 And a note to fellow jaw surgery heroes: Do not attempt to juggle during your recovery. I tried to prove my worth in the juggling business and ended up throwing a ball right into my face. It sent pins and needles everywhere, which I suppose is a good thing because it means my nerves are responding. I apologize for my previous rant about the weather. I’m ashamed already. Stephanie, I can’t actually recall when the swelling stopped showing up at the end of the day. I remember dealing with it for at least a couple of months, though. You’ll get over it. Have patience, my friend! Hey graham, I must be driving you nutz. I’ve been out and about with friends and pretty much been okay in a crowd. When I stay home i just stare in the mirror and get depressed. As days are comming and going I’m finding.g my swelling gets worse at the end of the day. Uve told me a million times, its because I’m talking more. When did you atop blowing up Like a puff’n? That first meal is glorious, isn’t it, Abby? Congratulations on having your wires removed! Today is my day 43 and I am unwired and able to open my mouth for the very first time in 6 weeks 🙂 Somewhere on here, I read a comment from someone saying it felt like their jaw was on springs – that is a good description! It felt extremely strange and when my surgeon told me to open my mouth, I said “I don’t know if I can” haha. But I did, a little bit. Then I brushed my teeth like three times, then I went out and ate an entire third of an omelet, which was the best thing to happen to me in 6 weeks. Fah, it’s a good day indeed when that swelling finally subsides. It will go away eventually. Maybe try sleeping with a heat pak on your face. I’ve never been to Lethbridge. I’ve only heard legends of the immense amounts of wind that pass through that city. Thanks for linking the song! And I can understand the frustration at waking up to snow. We’re usually in the 30’s by the end of May – but it’s been in the low 20’s and high-teens, which is very unusual – and we’ve had snow this month – there was snow on the mountains down to a few hundred feet above the valley floors, so I empathize! I visited some friends in Raymond/Lethbridge a few years back in August and was surprised at how cold it was in the morning, but how nice it was by noon. Makes me want to visit Alberta again! If I were him, I wouldn’t be too worries about the healing. Sure, it’s a few months, but what’s a few months in the long run? The permanent nerve damage is a very real risk though, so if he’s not too concerned with his bite, I wouldn’t do the surgery. I’ve wanted it for years, so nothing was going to change my mind. By the way, I read through some of your posts on your site. Good looking website. I have a lot of respect for you and your weight loss story. That’s incredible. 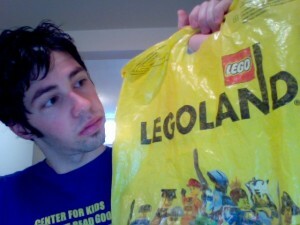 I actually just laughed when I saw the Legoland bag. I’m starting to wonder if you and my husband weren’t separated at birth. He’s also a big Lego nut (he has a website http://mightor.wordpress.com/ ). Also, strangely, he has jaw issues. He has that thing where he has a sort of long chin and narrow jaw, where his back teeth go together but he has a large gap in the front. Makes it very difficult when eating sandwiches and I would never bother making corn on the cob. We’ve discussed surgery a few times but he doesn’t feel that he’s hindered enough by it to risk the permanent nerve damage and lengthy healing process. Reading your blog has definitely opened my eyes to what he would be going through, eish. Trust me, you’ll be so excited that you’re eating something that you won’t care. You should be able to cut up a hamburger, chicken patty, etc, and eat it with a fork sooner than 2 weeks. So it was only 2 weeks then! I can definitely handle that! Alberta sounds a lot like Buffalo. I got the go-ahead to chew on April 19. I may have been able to bite through hamburgers/sandwiches sooner, although ripping through a wrap was too much a week ago. I have full range of motion of my jaws now, which is pretty much required to bite through a sandwich. Alberta is flat, cold and full of farms (with the odd city scattered about). It’s cold and snowy for about 7 months of the year, then bearable for 2, then really nice for July-September. It’s good for… having no Provincial Sales Tax and lots of oil. But our fuel is still expensive. To be honest, I’d rather live by water. How many days has it been since you got the okay to eat again? I’m wondering how long I should plan on waiting before going out for burgers. Have you tried taking ibuprofen before talking a lot, or drinking a icy margarita during your chat sessions? I understand your weather rant. Three years ago, I worried about snow on my May 2 birthday. This year, I worry about carpenter bees burrowing into my deck in the sunshine. What is Alberta like? I only have a sense of what Ontario is like.